You are here: Home › About › Programs and Events › “The Vermont Movie” FREE on Friday evenings! 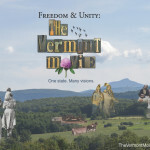 “The Vermont Movie” FREE on Friday evenings! 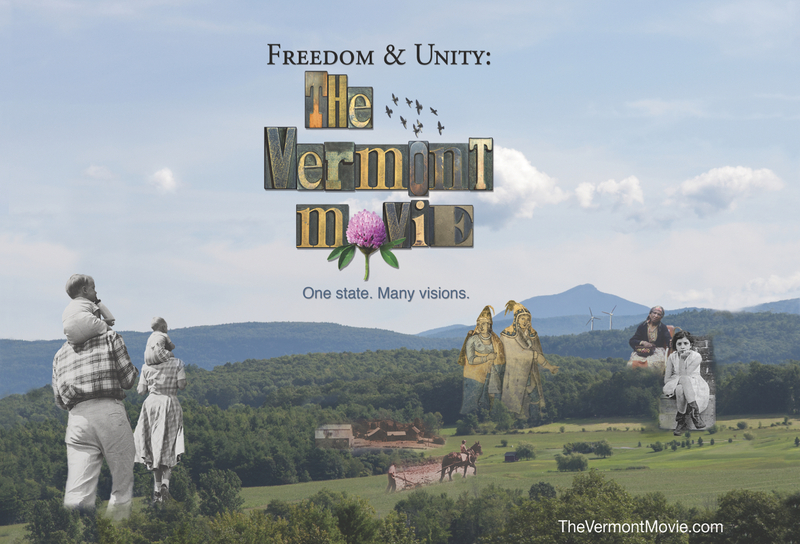 The colorful and fascinating history of Vermont is the focus of the six-part film Freedom and Unity: The Vermont Movie in a series of free screenings in Poultney. Sponsored by the Poultney Historical Society, all six films will be shown on Friday evenings at 7 PM at the Poultney Public Library, 205 Main Street, Poultney Vermont. Each film is about 90 minutes long and the series is the work of more than 50 filmmakers, coordinated and edited by Nora Jacobson of Norwich VT.
Three films were shown last spring and three will be screened this fall. Donations are welcome will go to the Poultney Public Library building fund. This episode explores the roots from which the future state of Vermont grew. Samuel de Champlain steps into a canoe, paving the way for Yankee immersion into native culture. We look at early settlement, native peoples’ resistance, and the little-known history of African American settlers. Pioneer rebel Ethan Allen leads the struggle for independence, resulting in Vermont’s radical constitution- the first to outlaw slavery. Finally, Vermont’s heroic role in the Civil War reminds us that, despite occasional missteps, Freedom & Unity— Vermont’s state motto—continues to chart the state’s course into the present. This film deepens the journey, digging beneath the surface of Vermont’s bucolic image to explore labor wars, eugenics experiments, the McCarthy era, and progressive Republicanism. Covering over a century—from pre-Civil War to 2009—it chronicles the rise of unions and quarry work, Barre’s Socialist Labor Party Hall, the marketing of Vermont, the state’s reaction to New Deal policies, George Aiken’s gentle populism, and Republican Ralph Flanders’ heroic stand against Joe McCarthy during the Red Scare. Emigre?s from urban areas, “back-to-the-landers” like Helen and Scott Nearing and filmmaker Nora Jacobson’s father, Nicholas Jacobson, came to Vermont in search of an alternative lifestyle. In the mid-20th century, political pioneers like Bill Meyer, a Congressman who challenged the Cold War, and Governor Phil Hoff, whose 1962 victory set the stage for historic change, rose to take the lead in state politics. Innovation was everywhere: in the work of “talented tinkerers” like Snowflake Bentley and Thaddeus Fairbanks, in the rise of IBM, and in the creation of the Interstate highways. We see the pros and cons of the highways–the high price of “eminent domain.” Revolution was in the air—rare archival footage provides a vivid look at the “hippies,” the realities of communal life and the paths of members of the counter-culture who established roots in Vermont. Who changed whom? These films were produced with the support of the Vermont Community Foundation, the Vermont Department of Libraries, and the Vermont Humanities Council.